Run, Scrap, Eat, Bike. Not necessarily in that order. It’s been about 111 years since I last posted on my blog, so I thought the opening of a new restaurant in Medina would be the perfect time for my return. 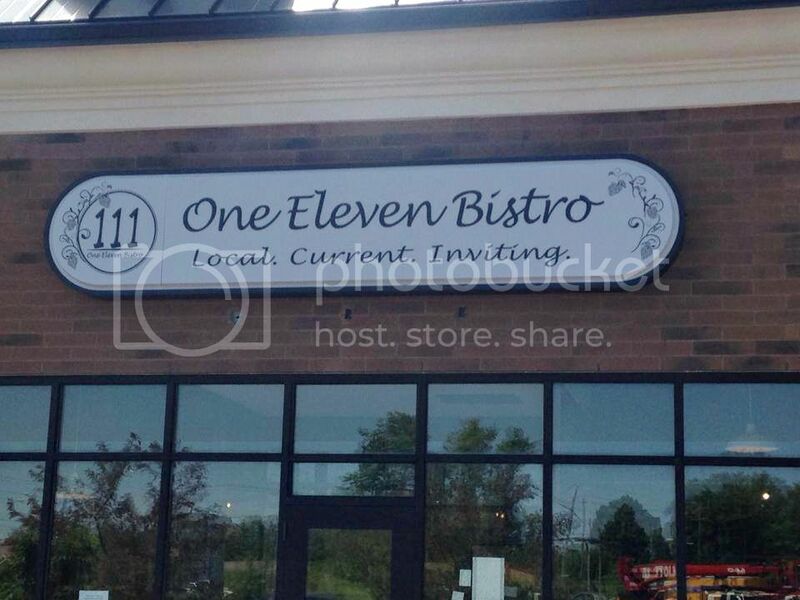 This restaurant is 111 Bistro and I hope you see what I did there. Here’s a photo of the front that I shamelessly stole from their FB page. And then sharpened and lightened in PS because otherwise it wouldn’t look like it went with the rest of mine and you would know I didn’t take it. Except for me just admitting it. Best restaurant reviewer EVER. From what I understand, the philosophy behind 111 Bistro is fine dining in a casual atmosphere. I would say they hit that mark. The restaurant itself is nicely decorated. Nothing high end enough to make you feel underdressed, but tasteful enough that you feel like you are at a nice place. The servers were in jeans and company t-shirts. Some patrons were dressed up, others were in shorts. Really a mixture of all kinds. Tonight was just the soft opening, which was theoretically by invite and reservation only. We had the invite because of my son working there, but didn’t make the reservation until 6:25 and they had one for 6:45. We were seated almost immediately when we arrived. One of the owners was at our table within a minute or 2 to introduce herself and welcome us, which I thought was nice. I did fess up and tell her I was Cody’s mom and we talked about him a bit. I didn’t, however, tell her I was going to review the meal or restaurant. Probably because I didn’t know. I did not take his future employment into consideration while composing this post. Since the idea of this review kind of came to me midway through my second cocktail, I probably don’t have as many photos as I should. They’re also probably not as good as they could be because, well, cocktails. But speaking of cocktails! Since it was a brand new place, I felt compelled to try one of their specialty cocktails. I’m normally either a beer or iced tea drinker (or margarita! ), so I don’t know where this inspiration came from, but it was the best decision ever. Naturally, I don’t remember exactly what it was called. Hey, I’m not a real food critic or restaurant reviewer, cut me some slack! 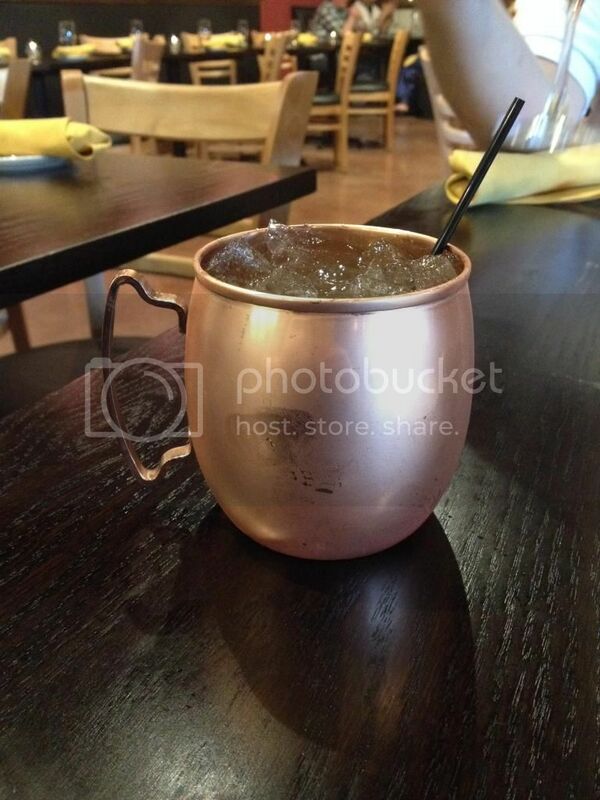 It was the first one on the mule menu… Georgia something. The ingredients were ginger something and ginger beer and I don’t know what else. I wish I’d taken a photo of the drink menu. I do have a photo of the drink, though! Is that adorbs, or what? The server told me it’s a specially designed cup to keep the drink cold longer or something. Not like I needed THAT but it sure was cute. Not only cute, but actually the best cocktail I’ve ever had. No lie. I am pretty passionate about ginger, so keep that in mind, but boy howdy that was a good drink. While we are on the subject of cute and water… we got an additional little carafe of water. Love these little touches, though I would have enjoyed some ice in the water. Not a huge deal, as I’m sure they’d have given me some if I’d asked, I just didn’t care enough. My husband asked the server what red wine she recommended and then I punched him. Because, seriously, it’s basically her first day! She probably doesn’t even know what wines they HAVE, never mind which ones are popular or good. She didn’t miss a beat, though, and offered to go get the bar manager who “loves to talk about wine”. He came over right away and they discussed wine while I tuned them out and checked Facebook or whatever, because I don’t care about wine. He was very very happy with the wine that was recommended, though. As a starter, I ordered the wedge salad because OMG I LOVE WEDGE SALAD. It took a while to come out, but not annoyingly so, and since it was their very first day, to be expected. The dressing was absolutely to die for. The tomato confit was good, as well. The speck… meh. I’ve never had it before, so I’m not sure what it’s supposed to be like, but it was pretty much hard to chew, disappointing bacon. I’d have rather had bacon, but maybe I’m just not fancy enough to appreciate speck. It didn’t bother me, though, I still ate it. My only real complaint was that it was just entirely too much lettuce. I could have had that salad as my meal and been full, except that there wasn’t enough dressing for that much lettuce. Honestly, though, they could have given me that same amount of dressing with half as much lettuce, still charged the same $7, and I would have been perfectly happy with it. The portion was just way too big especially considering I had a meal coming. Having said all that, I would definitely order it again! My husband had the hummus appetizer, and again we thought the portion was overly generous. It was definitely enough appetizer for 2 or more. There were 2 kinds of hummus, both delicious, and pita triangles to dip. When I think of ‘pita chips’, I expected them to be crispy. They weren’t exactly crispy, but not soft like you’d think of pita bread, either. They were more like a dense biscuit, for lack of a better description. I wasn’t sure how I felt about the texture, but the flavor was good. No picture because… well I don’t know why. The main course(s) followed soon after. Our table wasn’t really big enough for the salad plate and the dinner plate, and I hadn’t come close to finishing that salad, so it was a bit awkward to shift stuff around to make room, but it worked. I also only ever got the one fork, but I just attributed that to new staff. I didn’t mind reusing it, it’s my own cooties. 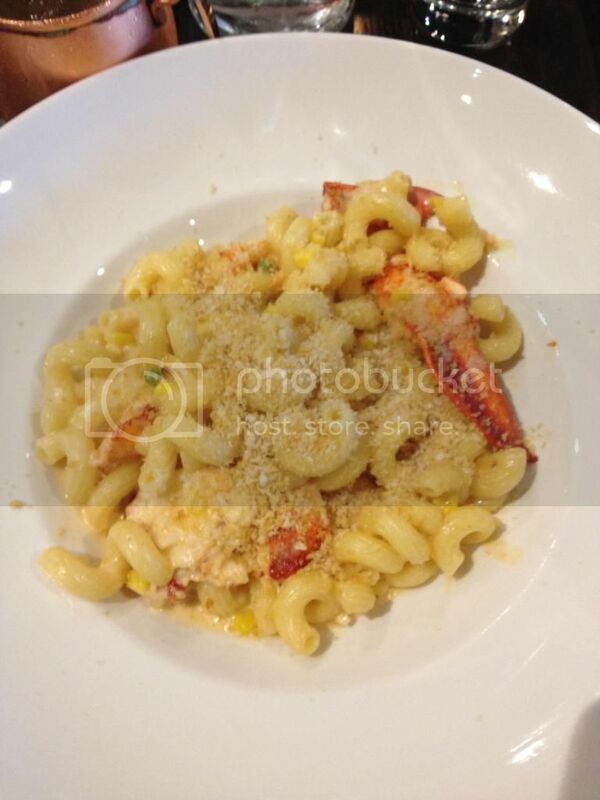 I ordered the Lobster Mac. I do not have a single bad thing to say about this dish. The sauce was divine, and there was just the right amount of it for the amount of pasta. The pasta was perfectly cooked. The bread crumb topping was good, and normally I am not a big fan of bread crumb topping. But the lobster… oh my stars the lobster! Delicious and so much of it. Very generous hunks, and lots of them. I don’t know what my star rating even is, but this dish gets all of them. Just to throw one more dish in here, my husband ordered the Beef Short Rib, which was also delicious. 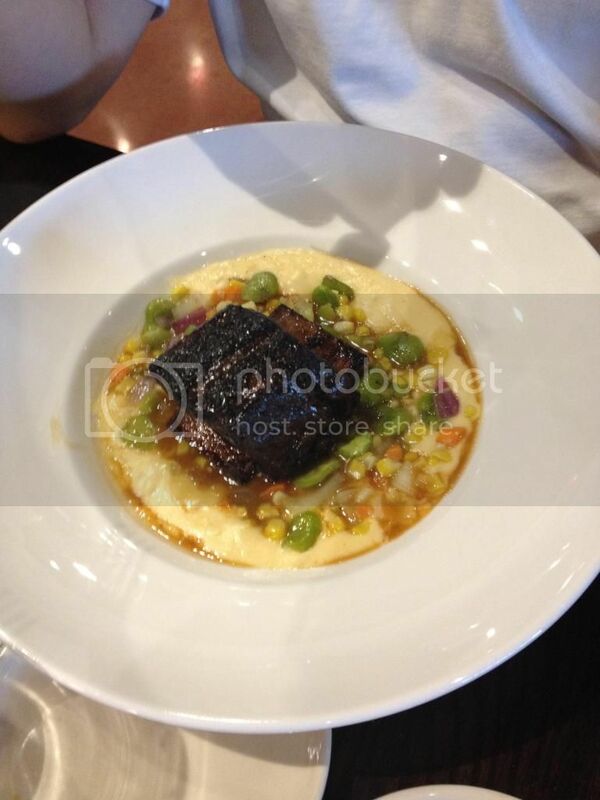 It was tender and fell off the bone and fava succotash sauce, well I wouldn’t mind dying face first in a bowl of that. Here’s a stunning across-the-table shot of his dinner. He finished his all gone. I brought about 1/3 of my lobster mac home. I had better than half the salad left, but I didn’t bring it home, because ew leftover salad. Plus I’d basically licked all the dressing off. DON’T JUDGE ME. All in all, an excellent meal. I highly recommend all of the dishes we had, and I look forward to trying many more (along with more of those cocktails. How late are they open?). They open for good on the 17th. Check them out at 111bistro.com or on Facebook. They’re open for dinner only during the week, but have brunch on Saturday & Sunday. 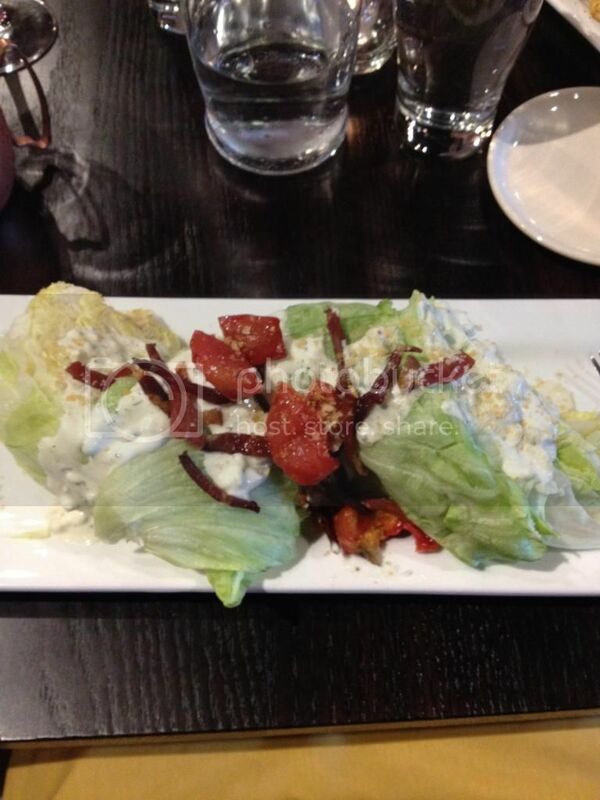 This entry was posted in Restaurant Reviews on June 13, 2014 by admin. August 1st – DigiScrap Parade Blog / FB Train is live! Most of the scrapbook pages you will see here were made with products that I received for free. Several designers provide me with product in exchange for the pages that I make. However, I share these pages here, not out of contractual obligation, but because I love them, and I hope that perhaps they may inspire someone to document their own family memories. None of the designers/stores I create for require me to post on my blog, I do that by choice.